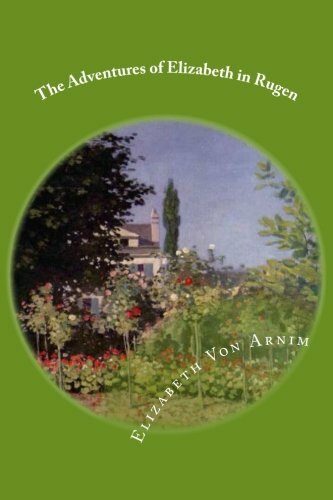 The Adventures of Elizabeth in Rügen is a travel journal written by Elizabeth Von Arnim. Elizabeth's goal is to ride her coach around Rügen, Germany's largest island and a popular tourist destination. Von Arnim records her journey with enlightening and always witty observations. Elizabeth von Arnim (31 August 1866 &#x2013; 9 February 1941), born Mary Annette Beauchamp, was an Australian-born British novelist. By marriage she became Gr&auml;fin (Countess) von Arnim-Schlagenthin, and by a second marriage, Countess Russell. Although known in her early life as Mary, after the publication of her first book, she was known to her readers, eventually to her friends, and finally even to her family as Elizabeth and she is now invariably referred to as Elizabeth von Arnim. She also wrote under the pen name Alice Cholmondeley.